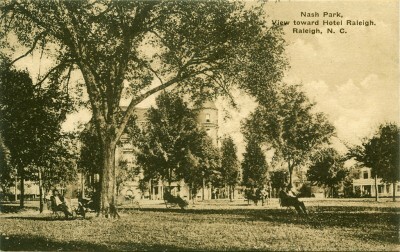 Nash Square, showing Union Station, Raleigh, N.C. This week’s Flashback Friday postcard features an early image of Raleigh’s Union Station as viewed across Nash Square. The old building still stands at the corner of Dawson and Martin Streets, but you would hardly recognize it today. I’m guessing a young fellow was practicing his penmanship when he wrote this message to his father back in Oregon about his cross-country train trip. Got in Greensboro at 10:30 p.m. and changed cars. Then we went to bed and slept till 3:30 a.m. Then we got off the train and went to a hotel to fin[ish] our sleep. Perhaps the hotel young Master Colwell went to catch up on his sleep was the Hotel Raleigh, which was located just across Nash Square from the station. 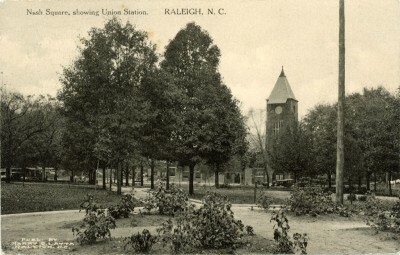 The Hotel Raleigh, with its prominent corner tower, mirrored Union Station across Nash Square. It is an elegant structure and one of which Raleigh may feel proud. … The interior is handsomely finished in oak and all the waiting rooms have been furnished with elegant and comfortable oak settees of unique design. … the waiting rooms are equipped with lavatories and closets of the most approved model and thorough convenience. 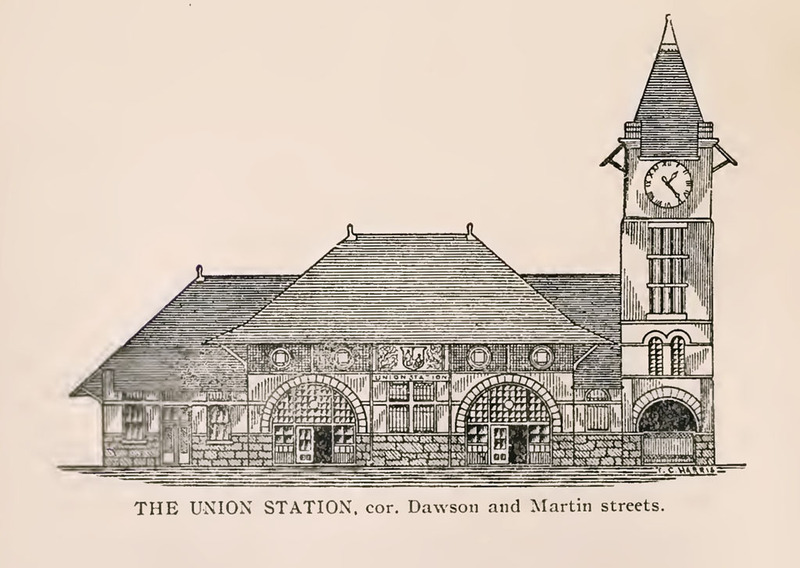 This illustration of the new Union Station accompanied a glowing article on the front page of the N&O on August 21, 1892. 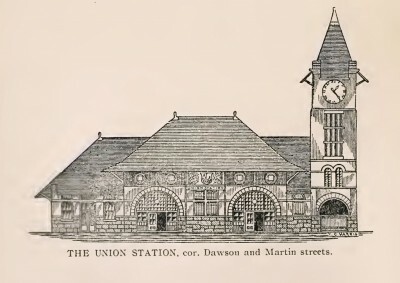 Union Station featured two block-long passenger platforms, elaborate decorative brickwork, a massive slate roof, and a prominent 60-foot tower on its northeast corner. This retouched photo dating from 1928 shows the façade of Union Station sporting great double marquees that were never built. 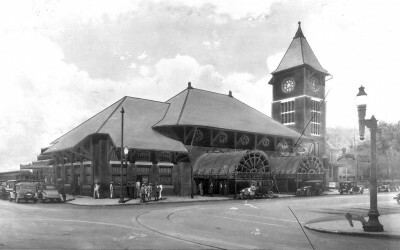 The design of Union Station followed the ‘stub-end terminal’ model, which required trains to either back in or back out of the car shed. This inconvenience ultimately led Seaboard to build its own ‘run-through terminal’ station just north of Peace St. in 1942. Southern Railway followed suit with its own ‘run-through terminal’ station on Cabarrus St. in 1950. The Seaboard Station is now occupied by Logan’s Garden Center and the Southern Rwy station now serves Raleigh’s Amtrak passengers. 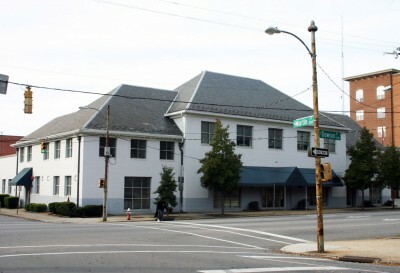 The railroads ultimately sold the Nash Square property, and the abandoned, outdated relic of a bygone era was repurposed in the early 1950s as an office building. 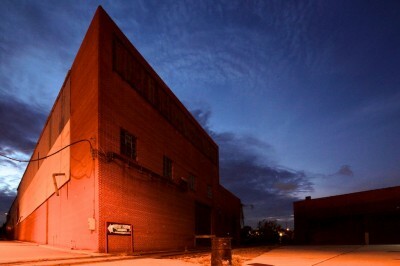 A second floor was inserted in the vast interior space, the wide overhanging eaves were removed, the façade was bricked over, and, sadly, the grand 60-foot tower was demolished. Today, Raleigh’s old Union Station, though now but a shadow of its former self, still presides over Nash Square at the corner of Dawson and Martin Streets. Happily, a new Raleigh Union Station is now being planned to accommodate 21st century train travel. The regional transportation hub will occupy a long-vacant warehouse in the former Dillon Supply complex a couple blocks to the west of the old station. Groundbreaking is scheduled to take place in 2015. The public is invited to attend the third in the series of Public Information Sessions regarding the planning and design of the future Raleigh Union Station. The purpose is to solicit input regarding program elements. Conceptual plans will also be available for review and comments. 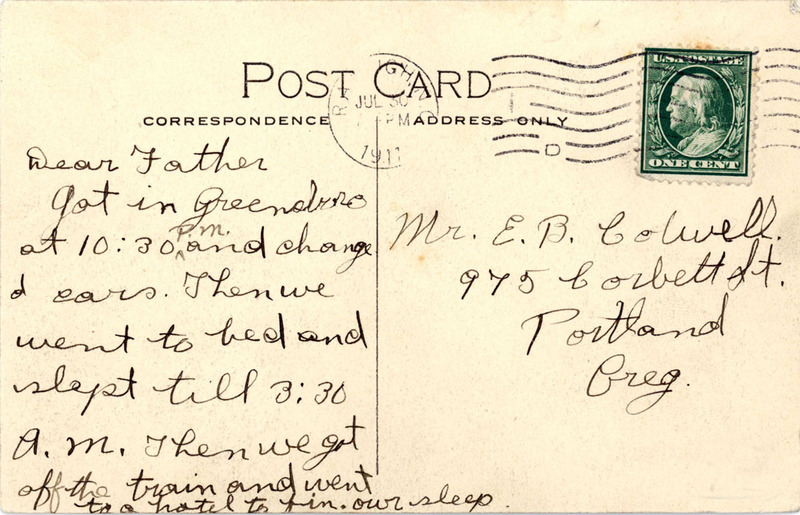 The event will be held June 26, 2013, 6-8 pm, at the Contemporary Art Museum (CAM), 409 W. Martin St.
Our feature postcard this week was published by Harry C. Latta, and mailed in 1911. Latta was the chief clerk at the Hotel Raleigh, and probably commissioned this card to be sold to guests. Great post, Raleigh Boy. It’s easy to see that Nash Square used to have a much higher profile in the lives of Raleigh residents and visitors. 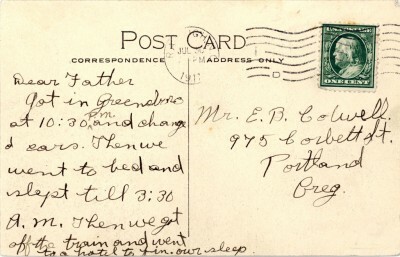 And today’s postcard is a fascinating companion to the Hotel Raleigh one you featured last July, where the author wrote about turning Fred over to a deputy marshal. The postcards were written on the same day to the same address. Today’s seems like the prequel, and raises more questions than it answers. Anyone up for a check of the 1910 census to find out how many Colwells lived at that Portland address? The family (Elmer B, Eleanor, and Elmer S (or T) is living at the same location in 1900. I made a boo boo. Eleanor Teed Colwell died in 1945. Ex-Representative and Progressive Party Worker Succumbs From Attack That Came During Presidential Campaign. Elmer B. Colwell, United States Marshal for Oregon from 1910 and 1911, died at 7:20 o’clock last night at his home, 975 Corbett Street. He had been practically an invalid from heart trouble for the past two years. Up to two years ago Mr. Colwell was a strong and robust man. In the Presidential campaign of 1912 he worked hard in the interest of Theodore Roosevelt. He was in the Progressive party headquarters in the Oregon Hotel one day in October, near the end of the campaign, when he suddenly collapsed from heart disease. Though eventually he partly recovered, his health had been precarious ever since. A few months ago he suffered another attack and was in the hospital for some time. He became enough better to be able to be about again, but his condition remained such that it was felt he might die suddenly at any time. Mr. Colwell had been a resident of Portland for many years. He was appointed United States Marshal for Oregon by President Taft in the Fall of 1910, succeeding the late C. J. Reed. His appointment was obtained through the influence of Dr. Henry Waldo Coe, now Progressive National committeeman from Oregon, but at that time one of the most influential Republicans in the state. He is survived by his widow and two sons, Elmer B. Jr., and Russell T. Colwell. Mr. Colwell was born in Millport, Pa., February 11, 1868. In 1872, he went with his parents to Manistique, Mich., he went into business with his father in the Globe Extract Works. He was married to Elinor Teed in 1890, in Detroit. He came to Skamokawa, Wash., in 1888, where he went into the lumber business with his father, his uncle and Captain Montgomery. In 1895, he was elected auditor of Wahiakum County, Wash., and was re-elected in 1897. Coming to Portland in 1900, he became secretary-treasurer of the Multnomah Trunk & Box Company. In 1904, he was elected Representative from Multnomah County. Mr. Colwell was a Mason of high degree. He was a member of the Rainier Blue Lodge, Royal Arch Chapter No. 3, Oregon Commandery No. 1 of the Knights Templars, a member of the Mystic Shrine and of the Rose City Chapter of the Eastern Star. Arrangements for the funeral are not completed. It looks like Raleigh Boy was right in suggesting that these postcards were written by a boy practicing his penmanship, and not as I assumed last year, a traveling U.S. marshal writing to his wife. Raleigh Boy, do you have any more postcards from young Elmer? According to the 1930 census, young Elmer grew up to be a statistician. Private funeral services for Elmer T. Colwell, 2019 SW Main St., will be Monday at 10 a.m. at Caldwell’s Colonial Mortuary. Private burial services will follow at Riverview Cemetery. Mr. Colwell, a Portland real estate broker, died Wednesday at the Portland Hear Hospital. He was 67. He was born July 29, 1897 in Cathlamet, Wash. He attended Oregon State University where he was a member of Alpha Kappa Psi Fraternity. He was a member of the Royal Rosarians and the Portland Optimist Club. He is survived by the widow Lila J. Colwell, Portland, who is in Europe, and a brother, Russell M. Colwell, also of Portland.